Aquatint of Madras (now Chennai) in south India, published by Edward Orme in 1807 and part of King George III's Topographical Collection. Madras was the first important settlement of the East India Company and was founded in 1639 by the agent Francis Day on land ceded by the Raja of Chandragiri. The site, on the coast of the Bay of Bengal in south India, had been associated with early Christianity and the apostle St. Thomas is believed to have been martyred here in 68AD. The Portuguese arrived here in 1522 and built a church, but were evicted in the 17th century. The English settlement sprang up around a small fort and Madras gained eminence, remaining the centre of power until eclipsed by Calcutta in the late 18th century. This print shows Government House to the left and the Council House to the right. 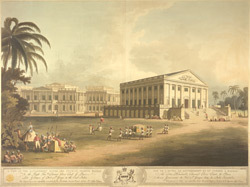 The neo-classical Government House was a remodelled version of an earlier Portuguese edifice used by Edward, the second Lord Clive, Governor of Madras from 1798 to 1803, to which was added (in 1800) a two-storey classical facade with deep verandah and irregular colonnades.